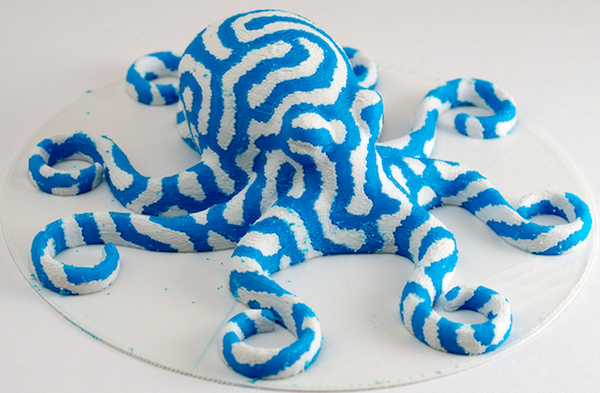 This octopus was generated through a “simulation of reaction diffusion on a mesh” and printed on a Replicator 1. This cat was done the same way. This globe was put together with the Dual Extrusion feature of ReplicatorG and printed on a Thingomatic with dual MK7s. The dualstrusion definitely adds a touch of realism. This is a rather creative use of dualstrusion, giving the ability to control how much light and dark there is in the room. This print is the most meaningful of the list because it demonstrates that with appropriate layering, various shades can be achieved with only two colors. The technique is very similar to what high-end Objet printers do to achieve grayscale prints. These prints support the prediction that we’ll have affordable enterprise-class printers in a few years.